How to remove mounted locations that have been added using the mount command? I've mounted few shared locations using the below command. A few incorrect locations* have been erroneously mounted while running this command. Now when I execute just the mount command, it lists all the right and wrong locations I've mounted. I have mounted the same location multiple times. How do I remove locations that show up from executing the mount command so that I can remove the incorrect ones I've mounted? The umount command does not help me remove the mounted location. Here's a screenshot showing the results to the mount and umount commands. On Linux, you can unconfuse the situation by moving mounts so that each has its unique, non-overlapping mount point. After this you'll have separate directories for each mounted filesystem, which you can explore and unmount at your leasure. maybe with umount -f ? but looking around I found something here. 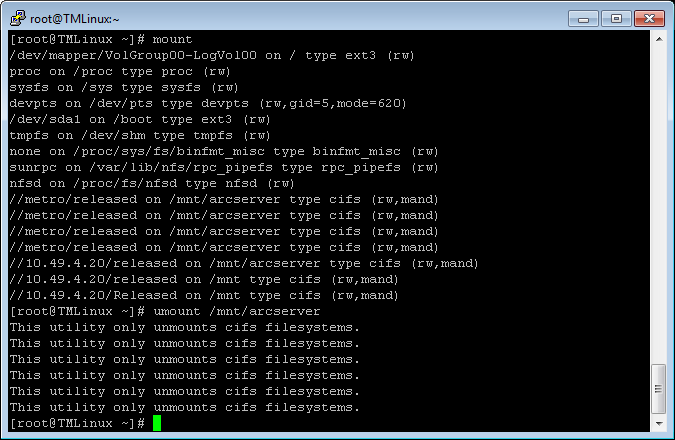 umount.cifs unmounts a Linux CIFS filesystem. It can be invoked indirectly by the umount(8) command when umount.cifs is in /sbin directory, unless you specify the "-i" option to umount. Specifying -i to umount avoids execution of umount helpers such as umount.cifs. The umount.cifs command only works in Linux, and the kernel must support the cifs filesystem. The CIFS protocol is the successor to the SMB protocol and is supported by most Windows servers and many other commercial servers and Network Attached Storage appliances as well as by the popular Open Source server Samba. Even though it reported an error, a subsequent run of "mount" shows that it's no longer mounted. fixed the problem for me. Not the answer you're looking for? Browse other questions tagged networking file-sharing or ask your own question. How can I access networked filesystems that I've mounted in Nautilus? WITHOUT using network command lines in linux, how to know list of open ports and the process that owns them? How do I measure the amount of network traffic that passed my debian installation? How do I verify the parameters set using tc command? My Network Adaptor is present, but using the command 'lshw' shows that the 'device is not claimed'. How to claim this driver/device? Is there any way to know how many sockets have been created by a C program?